Q: What is Ceramic Nano-Coatings™ ? A: Ceramic Nano-Coatings™ is an advanced paint protection system that is undeniably the world's most advanced automotive paint sealant due to its unique formula, durability and hyper shine and extremely low maintenance. Your car will look and feel different. You will never need to wax again, and you will have a lasting shine. Your car will also be protected from harmful elements, such as UV rays, acid rain and bird droppings. Ceramic Nano-Coatings™ is continuously developing new car care products and improving the current line of paint protection and car care products as new more advanced raw materials and technologies come available. Car Ceramic Nano-Coatings™ doesn’t offer a paint protection which was good 1, 3, 5 or more years ago like distributors of PTFE and glass plexin paint protection, our never ending development of paint protection and car care products means that you will have the product with the latest scientific technology. Q: How is this system different to other paint protection products on the market? A: Ceramic Nano-Coatings™ system is totally unique. It is not like any other product on the market today. Utilizing the cutting edge in nanotechnology and polymer science, Ceramic Nano-Coatings™ actually bonds to your vehicle's paint on a molecular level, forming a cross linked covalent bond. All paint sealants offered at car dealerships or detail shops have been based on modified silicone, which slowly degrades during normal driving conditions. In direct contrast, the same UV exposure that induces the oxidative decomposition of these sealants as well as loss of paint gloss actually strengthens Ceramic Nano-Coatings™. Other paint sealants like PTFE and glass plexin based sealant simply temporally electromagnetically bonds and sit inside the microscopic pores on your vehicle's finish, and wash away with simple detergents. Performance of those so-called paint protection systems is very limited due to their durability and ability to protect from harmful elements such as bird dropping, bugs etc. In addition, with the use of Ceramic Nano-Coatings™ your vehicles paint will remain permanently insulated against chemical attack from any kind of environmental pollutant, e.g., acid rain, bird droppings, insect fluids, tree sap and road grime. For this reason, Ceramic Nano-Coatings™ is able to offer the only LifeTime Performance warranty that stands on the merits of the product itself and not on a service that involves multiple reapplications and much of your time and additional expense. Q: What about the other Nanotechnology products on the market? A: There are some products on the market that claim how advanced their car care products are, but as a matter of fact products with silicium (SI14) do not undergo any chemical connection with the material to be coated on and this explains the impermanence of the "treatment". Another so called nano-product on the market with 2 years longevity, the "nanotech" label pertains to the physical structure of the film that is formed and not any actual nanoparticles. The 2 years that is given to the longevity is due to the inherent brittleness of the coating which is very much akin to glass with its Si-Si formations. Hence, once the organics are "burnt" off from the sun or alkaline contaminates, the film becomes silicate like and flakes off, though the material is too small to notice by the naked eye. Q: A car dealer wants to sell me a paint protection with titanium dioxide (TiO2), what is it? A: Regarding the competitor product, our understanding of the use of photocatalytically induced TiO2 is that in order for it to truly "burn-off" (oxidize) the organic matter (soils) it must possess an activity that will also oxidize the organic binder holding the mineral in place. This was also the conclusion that a world provider of nanoscale TiO2 also shared with us, ie., that they could not find a binder (coating resin) that would withstand the bond breaking action of the TiO2 they manufacturer. Hence, if the mineral is to be truly affective in oxidizing the road grime, it will also destroy the polymers (which contain organic cross-linkers) holding it in place. Q: Do you think to come around “the self destructing process” of TiO2 do I have to use some enhancement products like carwash shampoo, so you will top up the resin with every car wash? Or once a year top-ups with some enhancement product? A: Very likely. Dow Corning provides formulas that incorporate silicone, even functional ones that actually adhere, in car wash solutions and this is likely and most probably involves an aminofuntional silicone. Q: Some companies are using Carborundum or Silicon carbide (SiC) in their sealant coatings? 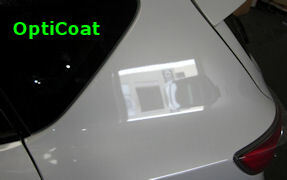 What is so called Opti-Coat? Well, I've applied Opti-coat 2.0 on 5 vehicles so far. It is completely gone on 2 of them and is already disappearing on a 3rd. I'm not sure what its status is on the other two as I haven't seen those vehicles since applying it. Those three I know for sure have only seen touchless washes or washes by me. The jeep received the Opti-coat 2.0 about one year ago. It beaded and sheeted water like crazy for a couple months afterward. Here is a video of the hood after being washed twice and how it reacts with water. 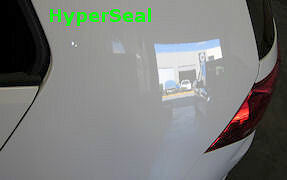 Three white cars, Mazda 3 MPS with Opticoat and VW Golf with HyperSeal and Hyundai Elantra with HyperSeal, the differences in transparency and gloss in the paint between two paint protection systems are very noticeable. Q: Other companies are claiming theirs coatings are very hard 9H, is it any good? A: Let’s see this way, first you have to know what “a pencil test” is. Now what it means to you? Shortly nothing, the problem with this 9H claim is as you know already or you will find later there is always something harder, much harder in the air, dust. Those fine dust particles contains sand, very hard and abrasive particles of silica, Quartz or other minerals then the paint coat can withstand. A problem with such 9H hard coatings is, they suffer from micro-scratching while withstanding the larger deformations. For this reason, you'll still see the usual amount of spider web formations even on coatings hard as 9H. One more thing we need to address, what is hard, usually is brittle. Perhaps when you shop for the paint protection you were told that you will get “life-time warranty” but you are required to have yearly inspection if not the warranty is just a few years. Why is that? The few years that is given to the longevity is due to the inherent brittleness of the coating which is very much similar to glass with its Si-Si formations. Hence, once the organics are "burnt" off from the sun or alkaline contaminates, the film becomes silicate like and flakes off, though the material is too small to notice by the naked eye. Q: What is your solution the problem above? 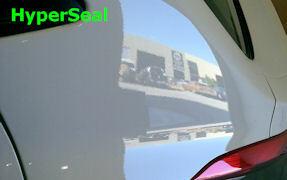 A: Our paint sealants are designed to absorb the scratch and then re-heal and are therefore more flexible and less hard. Our latest coating the PermaGloss™ with self-healing nanoparticles is a typical example of our solution to the problem. Q: Other companies are using so called glass-plexin paint protection, is it any good? A: We used this paint protection system for about three years in the past. You will get wow factor like from any other wax or polish, however wow factor will wear out in 6 to 12 months without using their specially design car wash shampoo ($100 a litre plus shipping costs). Non-polymer, non-organic type products usually exist as crystalline structures (e.g. salts or silicates) and are held together and crystallize on the surface by ionic bonding forces or static charge in this occasion a weaker type of bond. While initially capable of maintaining continuous films, these forces are not strong enough to prevent re-crystallization of the silicate upon exposure to water and moisture. Hence any protection afforded is a result of the silicate salt blooming to the surface of the polish before it is abraded from the paint finish. We hear from many sources that the applicators (dealers and car detailers) of this and also many other paint protection systems do not know or hiding this information from customers to get their deal. Instead they tell them, there is a yearly inspection and they are relying on that the customer will miss this inspection and therefore void warranty. Q: What are the key features of Ceramic Nano-Coatings™? Won't crack, fade, or fall off. Highly water and grim repellent! Creates a deep "wet look" paint. Q: How often will I need to use Ceramic Nano-Coatings™? A: The most robust Ceramic Nano-Coatings™ paint protection system will protect your vehicle for a minimum 10+ years without any renewal application or enhancement product. Q: Do I need to wax or polish my car from time to time? A: Absolutely not. In fact using wax or polish will diminish the gloss of the paint finish as they are not the same quality as our products. Q: How do I take care about Ceramic Nano-Coatings™ paint protection system to keep it in top condition? A: The maintenance is minimal and very simple. Just wash your vehicle on a regular basis with any car wash shampoo available on the market. Avoid car wash shampoo with any enhancing additives in it as they will dull the paint's appearance. Q: Can you apply Ceramic Nano-Coatings™ paint protection system for me? A: Absolutely, we can apply any paint protection system to your vehicle for you at our workshop in Ormeau. For busy people in Brisbane, Sunshine Coast, Gold Coast, Ipswich and Toowoomba we can come to you and have it done at your premises (some conditions apply). Q: Can I apply Ceramic Nano-Coatings™ paint protection system by myself? A: Absolutely, we encourage our customers to save $$$ with our DIY kits. All kits come with comprehensive, easy to follow, step by step instructions and because we use the same products in many cases as you would, we guarantee the same professional result with our DIY kits. We have many DIY kits to suit your needs and budget. Check our online shop or give us a call on 07 5549 1477 and we will help you with the right product selection.